Microsoft Outlook is one of the best email client preferred by home users and business users alike. It is the most popular email service providers around the globe. Moreover, Outlook supports multiple operating systems such as Mac and Windows. The Outlook application for Mac is also called as Outlook for Mac. It can save its mailbox data including contacts, emails, calendars, and etc., in OLM file format. Besides this, there is no option available in MS Outlook to set as the default mail client for Mac users. The reason being is that Outlook 2016 does not permit users to set it as the default email program itself, and it is also known as Sandboxing. This is quite is pretty baffling for Mac users, therefore, not easy to execute. Therefore, in this post, we will discuss step-by-step guide to set Outlook as default email client in Mac OS X in a very detailed manner. It is just a simple way to get Outlook application to act as the default program. However, if users do not have an email account setup in Apple Mail? In that condition, users will not be able to access all the preferences. 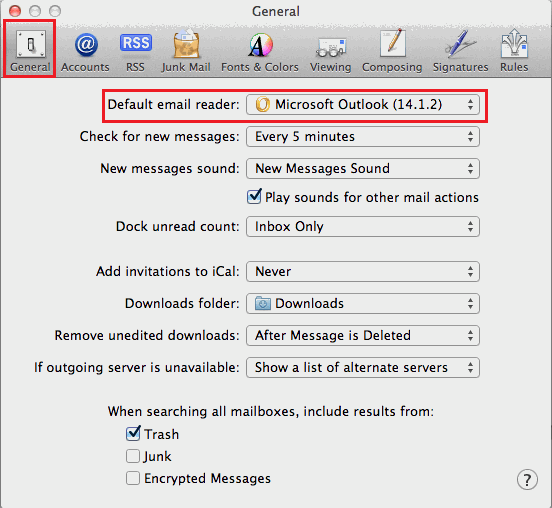 If end users have Outlook 2011 for Mac on their local system, then, users can set it as the default from there. This same procedure will be applied for Outlook 2016 automatically. Additionally, users can use IC-Switch program to set Outlook as default email client. So, Mac OS X users can utilize this application to change the default client. In the above discussion, we have learned about Outlook for Mac. Along with this, we have explained three feasible solutions which help to set Outlook as default email Client in Mac OS X. Be sure to follow each step more carefully. Hope this post will prove to be helpful for Mac users.